The birth of your baby is an extraordinary event and the George Washington University Hospital would like to thank you for allowing us to participate in this memorable experience. Throughout your pregnancy, including preconception preparation, we can create a warm and nurturing environment so that you’re comfortable and well informed. You can rest easy knowing that an expert obstetric team will work together with you to maintain the health and well-being of you and your baby. At GW Hospital’s Women's Center, we create an environment of warmth, comfort, assurance and encouragement before and after the birth of your child. Our labor and delivery suites offer you beautiful amenities, including private rooms and bathrooms. We believe a family-centered approach to childbirth can help promote the healthy growth and development of the entire family. The birth setting may be intimate and private, or openly shared with your family, partner or those closest to you. The Women's Center respects your birth plan and has a long tradition of catering to all family structures. Your loved ones will be welcomed and encouraged to participate in your childbirth experience. Nancy D. Gaba, MD, FACOG, and Whitney Pinger, CNM, FACNM, discuss the importance of preparing for childbirth with a solid birth plan in place. GW Hospital’s Level III B Neonatal Intensive Care Unit (NICU) provides comprehensive, high-quality and family-centered care for critically ill or premature infants. We reserve this unit for infants with a low birth weight, those who have difficulty breathing or those who experience other complications. This specialized emergency care is available 24/7, should your baby need it. Whether it's a Cesarean birth, premature infant or in-vitro pregnancy, The Women's Center offers the clinical expertise needed for your peace of mind. The dedicated NICU team includes neonatologists, residents, respiratory therapists and neonatal nurses. Nutritionists, a social worker, a physical therapist, a speech pathologist and a lactation consultant also work closely with the medical team to provide optimal care for your baby. 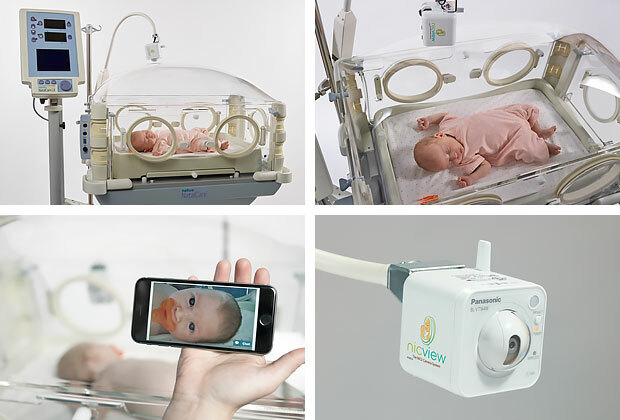 GW Hospital is proud to be the first hospital in the District of Columbia to offer NicView™—a small camera system placed at designated bed spaces in the NICU. NicView allows parents, family and friends to view their infant in real-time, 24/7, through a secure on-line portal. It is here to help add comfort and support as you bond with your baby even when you cannot be in the NICU with them. Family members can securely access NicView from anywhere there is an internet connection via a laptop, smartphone or tablet. The service is compatible with any internet capable device and most popular browsers. No other users will have access to your baby’s images unless you have provided them the log-in credentials. We recognize that having a baby in the NICU can be a difficult time where you miss your baby and may have some anxiety. We are pleased to offer innovative technology to support you in this time. Parents who are not interested in NicView can decline this service.